Imagine a prosthetic device capable of restoring decision-making in people who have reduced capacity due to brain disease or injury. by simply recording brain signals during correct actions and playing them back. This may sound like science fiction, but researchers at Wake Forest Baptist Medical Center, the University of Southern California, and the University of Kentucky have proven for the first time that such a device is possible in non-human primates. One day it will be possible in people, the scientists say. In essence, the scientists used an electronic prosthetic system to tap into existing circuitry in the prefrontal cortex of the brain at the cellular level and record the firing patterns of multiple neurons in the prefrontal cortex, the part of the brain involved in decision-making. They then “played” that recording back to the same brain area to electrically stimulate decision-based neural activity. Not only did it restore function, in some cases, it also improved it. “The prosthetic device is like ‘flipping a switch’ to turn on a decision in real time,” said Sam Deadwyler, Ph.D., professor of physiology and pharmacology at Wake Forest Baptist, and senior author of the study. In the study, the scientists trained five monkeys to match multiple images on a computer screen until they were correct 70 to 75 percent of the time. First, an image appeared on the screen, which the animals were trained to select using a hand-controlled cursor. The screen then went blank for up to two minutes, followed by the reappearance of two to eight images, including the initial one, on the same screen. When the monkeys correctly chose the image they were shown first, the electronic prosthetic device recorded the pattern of neural pulses associated with their decision by employing a multi-input multi-output nonlinear (MIMO) mathematical model, developed by researchers at the University of Southern California. In the next phase of the study, a drug known to disrupt cognitive activity, cocaine, was administered to the animals to simulate brain injury. When the animals repeated the image-selection task, their decision-making ability decreased 13 percent from normal. 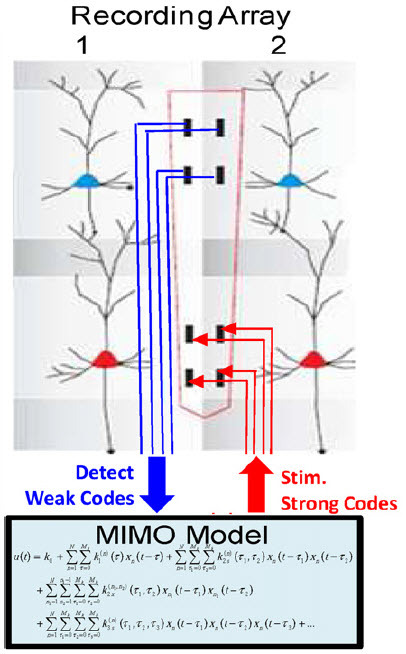 However, during these “drug sessions,” the MIMO prosthesis detected when the animals were likely to choose the wrong image and played back the previously recorded “correct” neural patterns for the task. According to the study findings, the MIMO device was exceedingly effective in restoring the cocaine-impaired decision-making ability to an improved level of 10 percent above normal, even when the drug was still present and active. “The basis for why the MIMO prosthesis was effective in improving performance was because we specifically programmed the model to recognize neural patterns that occurred when the animals correctly performed the behavioral task in real time, which is a unique feature of this particular device,” said Robert E. Hampson, Ph.D., associate professor of physiology and pharmacology at Wake Forest Baptist, and lead author of the study. “Based on the findings of this study, we hope in the future to develop an implantable neuroprosthesis that could help people recover from cognitive deficiencies due to brain injuries,” Hampson said. Co-authors of the study are: Ioan Opris, Ph.D., and Lucas Santos, Ph.D., Wake Forest Baptist; Greg A. Gerhardt, Ph.D., University of Kentucky; and Dong Song, Ph.D., Vasilis Marmarelis, Ph.D., and Theodore W. Berger, Ph.D., University of Southern California. The study was supported by the National Institutes of Health grants DA06634, DA023573 and DA026487; by National Science Foundation grant EEC-0310723; and by the Defense Advanced Research Projects Agency (DARPA), contract N66601-09-C-2080 to S.A.D.